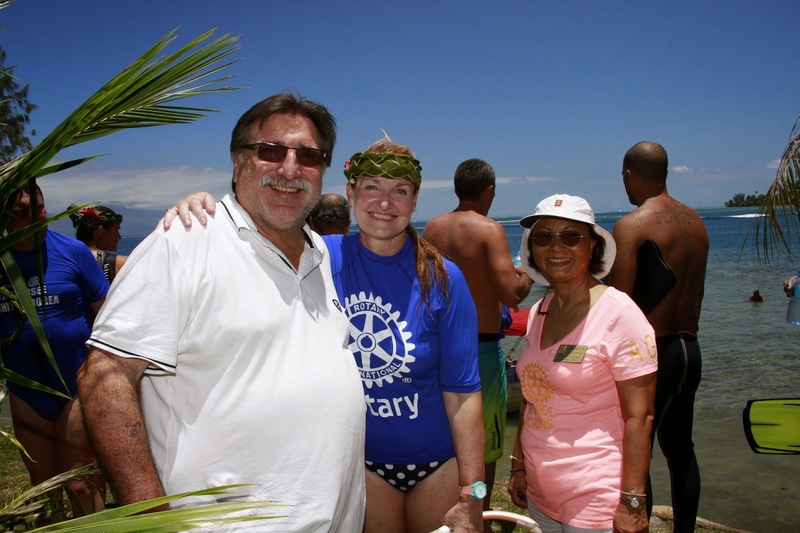 The Rotary Club of Papeete-Tahiti, French Polynesia, in partnership with the Rotary Club of Moorea, organised its tenth 18km swim between Tahiti and Moorea on November 15, 2014 to raise money for diabetes. The physical challenge was combined with a hugh diabetes awareness and prevention project that involved free testing in Moorea as well as sharing diabetes information. This latest adventure attracted 45 swimmers, representing partners, sponsors and Rotary, who swam supervised by an impressive security cordon that included the fire brigade, divers, an emergency doctor and nurses. 11 swimmers managed to complete the entire distance. Two Rotarian swimmers from the Rotary Club of Seymour, Australia, Don Wilson and Hugh Lawrence, came especially to Tahiti for the swim. Other swim visitors included a whale and calf and two sharks ! Great weather conditions and a calm sea allowed the crossing in a six hour swim. 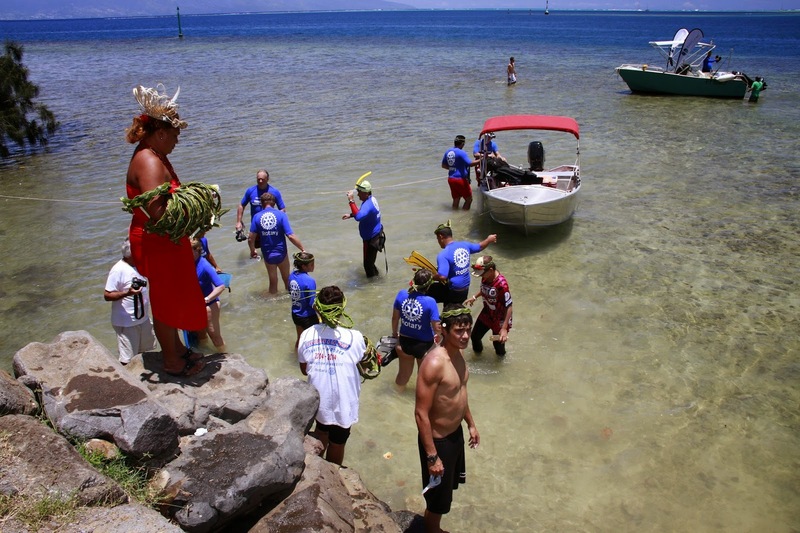 In the lagoon, all of the swimmers arrived together escorted by traditional Polynesian outriggers. The arrival was organised by the Moorea Rotary club. It included a traditional welcome with flowers, local fruits and a glass of champagne followed by a lunch for swimmers, partners and organisers. $A22,000 ($NZ 22,900) was raised last year for the Diabetes Association and medical research on diabetes in French Polynesia. For the 10th anniversary of the swim, all of the medical centers in high schools and comprehensive schools and fire brigades in French Polynesia will be offered by Rotary a complete blood glucose monitor kit. Once more extensive media coverage was achieved on two television channels, a 20 minute radio interview, live interviews every hour during the swim, and articles in local newspapers. One of the lucky swimmers won a Papeete-Los Angeles airline ticket offered by sponsor ATN. Thank you to the all the sponsors of this amazing event and partners who enable this dream challenge to become a reality. Where else can you swim, push your limits and raise such a significant amount of money while promoting and Lighting Up Rotary (Faire Rayonner le Rotary)?